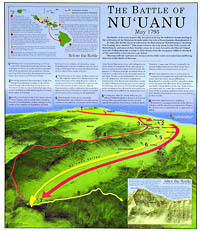 "The Battle of Nu'uanu -- May, 1795"
If this pivotal conflict had gone the other way, the publisher of this attractive and educational poster might have been Kalanikupule Schools Press. The poster's creator is University of Hawaii cartography student Rob James, who, with an earlier edition of the work created as a class project, won the National Geographic Award for Cartography last year. "It was a finals project," recalled James, who plans on getting his masters degree this fall. "I was really taking on a curiosity about the battle in Nu'uanu -- I mean, we've all heard about it, but we don't really know much about it. I wondered if I could help people understand how the geography of the landscape influenced the way the battle was fought." In the bloody internecine wars that united the islands under Kamehameha's rule, the assault on Oahu turned out to be the final phase, although no one at the time realized it. An invasion fleet of hundreds -- maybe thousands -- of canoes pulled up on the beaches on either side of Diamond Head and his warriors poured ashore. It was the largest amphibious operation in the Pacific prior to World War II. "It must have been amazing to see such a massive armada of canoes and ships," marveled James. The landings were unopposed, and Kamehameha's forces had four days to gather food and scout out enemy positions. The army began to move west and first clashed with Kalanikupule's men near Punchbowl Crater. Both armies used traditional Hawaiian weapons, augmented with Western firearms. Kamehameha, however, used European-style flanking tactics and sited cannons on the Papakolea ridgeline, routing similar positions held by Kalanikupule's cannoneers. Kamehameha's cannon's rained fire down on Kalanikupule's forces, which disorganized under the assault from above. From that point on, it was a running fight, a desperate rear-guard action as Oahu's defenders were herded up Nuuanu Valley. With their backs to the sheer cliff of the Nuuanu Pali, many chose to fall to their deaths than submit to Kamehameha. During construction of the Pali Highway, piles of skeletons were found jumbled at the foot of the cliffs. Kalanikupule managed to escape, scrambling up the Ko'olau ridgeline. Within a year, he was dead and resistance on Oahu ended. Kamehameha turned his eyes to Kauai and Niihau, but these were eventually annexed by diplomatic means. The physical nature of the Battle of Nu'uanu, particularly the mountainous flanking maneuver by Kamehameha's cannoneers, is explained vividly and in three dimensions on James' poster. "All of the rendering of the image was created by a program called World Construction Set, a standard tool used by mapmakers today," said James. "The raw information is called Digital Elevation Models and it is provided by the (U.S. Geological Survey). They have a 10-meter resultion." Although the islands were primarily grasslands in that era, the map is a bright green color. James explained that colors used by mapmakers aren't necessarily realistic. "We have to generalize sometimes -- otherwise, there's an overload of information." Research for the project consisted of "reading and reading and reading," laughed James. "And when the updated drafts were completed of the map, Kamehameha Schools Press sent it out for what they called 'peer review,' and much of their comments were incorporated in the final project." "I was struck by the sad, almost Shakespearian nature of the battle, in some cases brother against brother," said James. "Like the story of Ka'iana, who landed with Kamehameha but defected to the side of Kalanikupule. Ka'iana's wife Kekupuohi stayed true to Kamehameha. While attempting to kill Kamehameha, fighting his way toward the warrior king, Ka'iana was struck down by musket fire -- hit four times before he went down -- and died in his wife's arms. It's a classic tragedy and such a human story." Note: A review on these pages of Island Heritage's "Poisoned Palms -- The Murder of Mrs. Jane Lathrop Stanford" wondered why it seemed to end abruptly. It turns out the last chapter was omitted from the press run. The book will be reprinted and reissued some time next spring.